Nelson Mandela devoted his life to promoting democracy and equality, and he leaves behind a legacy of peaceful change. 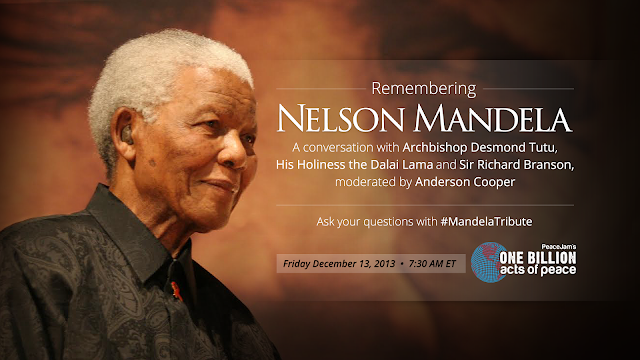 In advance of Mandela’s funeral service on Sunday in Qunu, South Africa, His Holiness the Dalai Lama, Archbishop Desmond Tutu, Reverend Mpho Tutu, the first female Irish president, Mary Robinson, and Sir Richard Branson will come together for a digital eulogy using Google+ Hangouts. Join them tomorrow morning at 7:30 a.m. EST. The conversation will be hosted by PeaceJam and The Nelson Mandela Centre of Memory, and moderated by CNN’s Anderson Cooper. Share your questions for the participants with #MandelaTribute. Tune in to celebrate the life of an individual who changed the world. This entry was posted on Thursday, December 12, 2013 at 5:38 PM. You can follow any responses to this entry through the RSS 2.0. You can leave a response.